The Boulderfist Clan was once one of the most important clans of ogres on Draenor outside of the empire. Leading up to the First War, the Boulderfist held sway over nearly every ogre in the lands close to the orcs. It was thanks to this that the first Horde came to their leader, Krol, to recruit the ogres for their war. Krol reluctantly agreed, diminished and in too much of a weak position to decline. Many ogres used their allegiance to the Horde to slip through the portal and flee as far from the orcs as they could, and the Boulderfist Clan began to shatter. One small section remained on Draenor, but after the planet shattered, Krol went missing and the clan found itself surrounded by enemies on all sides. Lantresor of the Blade, a half-orc from the Burning Blade Clan, took command of what was left of the clan and sought help against their foes. Meanwhile, on Azeroth, the rest of the Boulderfist Clan found themselves trapped in the Arathi Highlands following the wars between the Horde and Alliance. These ogres found the once proud city of Stromgarde under attack by the villainous Syndicate, who had assassinated their king. Ages ago, Stromgarde was the center of human power before it split into the Seven Kingdoms, and the Syndicate had brought it low. The Boulderfist Ogres took advantage of the weakened city to claim their own piece of it, using the fortified city to protect themselves from Alliance and, later, Forsaken patrols. When the Dark Portal reopened, however, Danath Trollbane, heir to the crown of Stromgarde and hero of the Second War, received news of his homeland. When the Burning Crusade was finally stunted, Danath returned through the Dark Portal, determined to save his homeland. Now the Boulderfist Ogres are caught between the scheming Syndicate and the full force of the Alliance. The player arrives in an ogre mound in Boulder’gor with emissaries from Nath’s servants. They meet with the leadership of the Boulderfist Clan, which is revealed to be Lantresor of the Blade, who, like Danath, heard news of his people’s plight and arrived to assist them. Despite his reinforcements however, you get the impression from other ogres that they have not been doing any better since his arrival. Your first task is to follow a tunnel built from one of the ogre mounds into the ogre-controlled section of Stromgarde at bolster the defenses there. Once the front is secured from the Syndicate, You are sent, using ogre shaman magic, to scout out parts of the city. You discover that the Stromgarde remnants have holed up in their district, preparing to pincer attack the Syndicate so they can join with Danath’s forces at the main gate, while the Syndicate seem to be preparing for some kind of summoning ritual. The ogre quickly deduce that having a demon run rampant would be more dangerous to them than the Alliance forces, and attempt to stop the Syndicate first. You fight your way into the basement of Stromgarde keep, only to find Lantresor of the Blade discussing a deal with Lord Falconcrest. Lantresor escapes and you are forced to fight Falconcrest and his bodyguard. As Falconcrest dies, he proclaims that neither the ogres nor the Alliance are a match for the Burning Legion. When you report back to the Boulderfist Clan, they deduce that if they don’t change something crucial about the battle, they will be crushed, demons or not. It is at this point that the wisdom brought by Nath’s servants come through, and with the knowledge that the forces attempting to break into Stromgarde are the original owners, the Boulderfist Clan decides to try out diplomacy with Danath and the Stromgarde forces. You meet with the remnants of Stromgarde hiding out in the city and they settle on a cease fire, providing the ogres help them join up with Danath’s forces. Once the ogres agree, you assist in an all-out attack against the Syndicate forces guarding the gate. Danath briefly thanks you when the armies meet up, but it isn’t until they set up a true base of operations in the ruins that you further discuss the terms of your Alliance. With the ogres and Danath’s forces officially joined together, you proceed to finish clearing out the city of Syndicate forces. At this point, however, the sky turns dark and a new evil is revealed. Nearby, at the Circle of Inner Binding, it is revealed that the Argus Wake cultists in the Syndicate have converted the area into a portal to the Twisting Nether. The combined armies of Danath and the Boulderfist Clan rush to stop the summoning, but the area is found to already be crawling with demons and cultists. You fight your way to the portal, but when you finally reach it, a powerful demon comes through. You and Danath defeat the demon, but it is then that you receive word that Lantresor has taken Boulderfist Hall and has turned the place into a bloodbath as his final stand. Danath laments that he needs forces to secure the portal until they can shut it down, but sends a detachment with you and some Boulderfist Ogres to stop Lantresor once and for all. You fight through hordes of twisted creatures to get to Lantresor, who proclaims his allegiance to the Burning Blade and the Burning Legion, and is disappointed in the ogres for betraying such power. After a harsh battle, you finally slay him and prevent the Legion cults from gaining a foothold on Azeroth, while also discovering that he had Krol captured and had been ready to perform a ritual on him. When the dust finally settles, the Boulderfist Clan, with their leader returned, and the people of Stromgade meet once more. Danath thanks the ogres and they finally settle on terms of their alliance. The ogres will continue to live in their mounds across Arathi Highlands while the humans retake Stromgarde. Both sides will help the other rebuild Stromgarde and Thoradin’s Wall to defend each other from their enemies. When the phase ends, you move into the real Arathi Highlands where Alliance players now have quests involving the further securing of the Highlands from Sylvanas’ Forsaken and forest trolls while Danath attempts to save his cousin and reclaims Trol’kalar and his heritage. Collect lamp oil, rope, and bombs. The Syndicate has supplies scattered throughout the nearby district of Stromgarde. All of them are things we could desperately use and things we’d prefer the Syndicate to be deprived of. It won’t be easy to get to them, but I have a plan. Visit the merchant, Mor’shu. He owes me for a stash of rubies I found in my ogre mound back home. He’ll give you a few items we’ll need if we want to get to the Syndicate. Defeat Lantresor and his minions. Lantresor of the Blade told us he was half-orc, half-draenei. He said he was a half-breed shunned by both of his people. What he did not tell us was why he was shunned. His eredar half is man’ari, not draenei. He is a demon and a servant of the Burning Legion. Go now and end his reign of chaos. 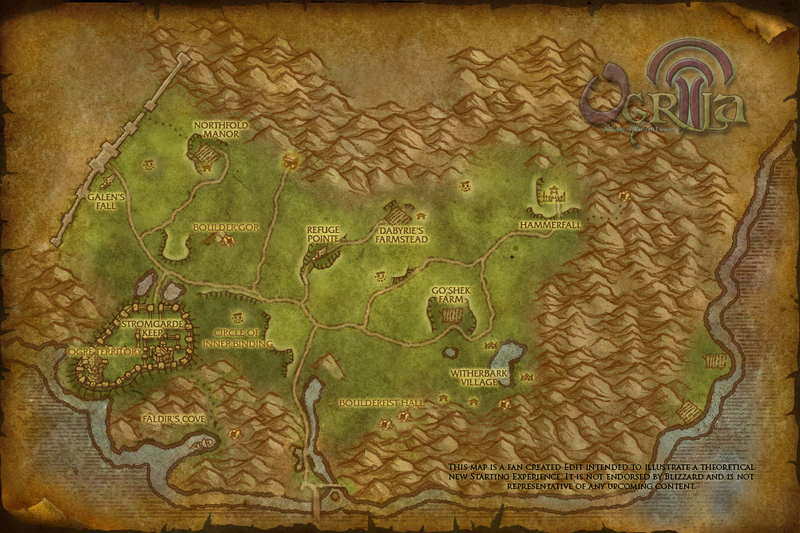 This zone will be an instanced version of the southern half of the Arathi Highlands. The main focus will be split between the ogre mounds and Stromgarde. The ogre mounds should be redesigned to be more unique for the experience, while Stromgarde will finally see the attention it deserves. Overall, the look of the zone will not be much different than normal, except phase changes when the Argus Wake is attempting to open their portal, and the twisted corruption seen in the final ogre mounds. No concept art available for this Zone. The original content on this site is fan created work intended to illustrate theoretical additions to World of Warcraft. None of it is endorsed by Blizzard and it is not representative of any upcoming content. World of Warcraft and associated art and concepts are © Blizzard Entertainment. All original content ©2009-2017 James Davies.